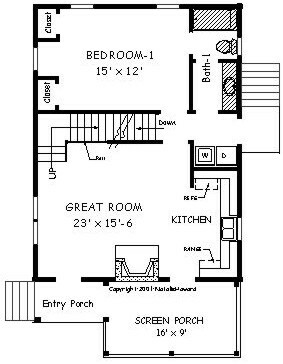 A tutor style, perfect for a mountain lot or a lake lot; narrow, but long from front to back, this plan boasts up to four bedrooms and quaint screen porch entry. The main area has living and kitchen combined, but an included alternate layout separates the kitchen and the living room if you desire. A unique feature, the screen porch cantilevers out with braces over the basement wall. 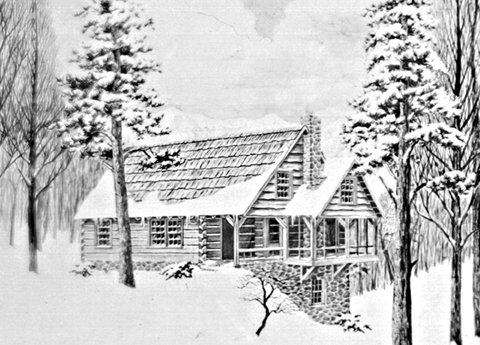 Narrow, but long from front to back, this plan can be built as a Tudor style, log or conventional frame home. Main room has living and kitchen combined. An alternate layout separates the kitchen and the living room. 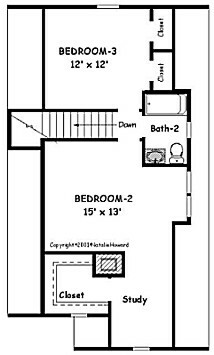 An additional upstairs layout makes Bedroom-4 a walk-in closet and small study. The screen porch cantilevers out with braces over the basement wall.